This is the mirror that goes with my Ashley Cataline dresser (which will be uploaded as soon as I can get some of the bounding mesh and slot function issues worked out). I cloned it from the base game floor mirror. It will hover at countertop height and seems to allow other objects to be placed in front of it. It looks nice as just a wall mirror as well. 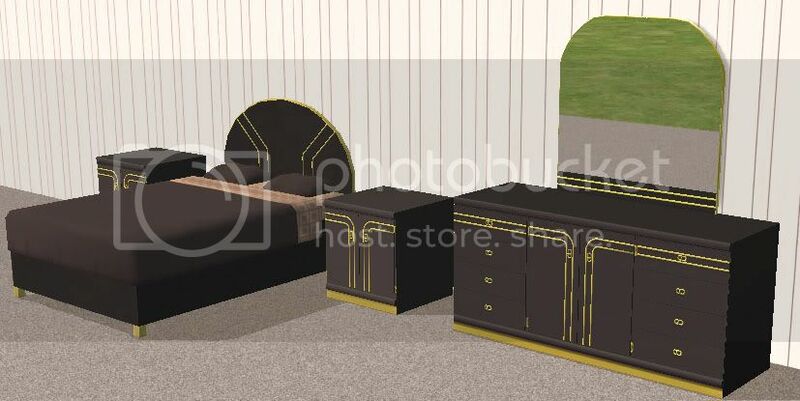 With the other furniture I uploaded it looks like this. It is footprinted as a one tile object but actually stretches out a bit into the edges of the tiles on either side of the main tile. I didn't think it was important enough to add more footprints and waste GUIDs. I wanted to keep it simple. Thank you to everyone who helped me with this! Special Thanks to Windkeeper for helping me get things to line up in the resource node! I created this with all expansion packs installed prior to Pets. I have not tested this with just the base game as I already have other expansions installed and my system resources are limited. However, if anyone has any problems with this whatsoever, please let me know. If you want templates or anything for recolors please let me know. I tried to make my textures simple and idiot label them for myself because I am very forgetful. You may use this in uploads of homes and such if you wish. I'm sure other people out there can do better textures than me so go crazy with it. I'd love to see what others can come up with. The mirror is rounded at the top and should fit seamlessly (I hope) with the dresser -- once I get that thing working properly. The mesh file is onyx with gold trim and accents. *onyxsilver1 is onyx with silver trim and accents. *malachitegoldmirror has both versions of the malachite mirror with gold accents. the only difference is that one has a black back while the other has the malachite texture. *malachitesilvermirror has both versions of the malachite mirror with silver accents. the only difference is that one has a black back while the other has the malachite texture. *lapisgoldmirror has both versions of the lapis mirror with gold accents. the only difference is that one has a black back while the other has the lapis texture. *lapissilvermirror has both versions of the lapis mirror with silver accents. the only difference is that one has a black back while the other has the lapis texture. (some of the above files have the su_ashcat prefix). If you have any questions, please ask. 80 people have said thanks to suceress for this download.